This series has meandered down a long and winding path from basic concepts to theory to practice. In this final post, I’m going to show a lot of really boring graphs and charts to answer the big question: What about performance? I think what people really want to know is, out of all the various ways storage can be configured, what’s going to provide the best performance? I will, as always, caution against being that person with an unhealthy obsession with performance. I’ve met too many individuals who will stress over an extra millisecond or two of latency in a system where no one will think anything is wrong unless the delay passes several seconds. 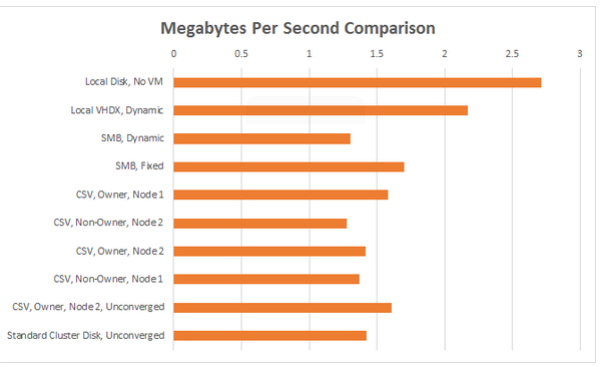 If you truly need ridiculously high storage speed and you are not already a storage expert, hire one. 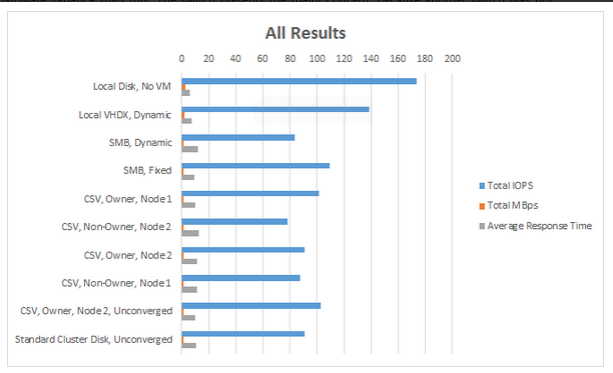 What I’m going to do in this post is show you performance results that were all taken from the exact same hardware configured in several different ways. The test was configured exactly the same way each time. What I want you to understand from that is that the numbers themselves are largely irrelevant. The hardware that I used is not up to the challenges of anything more than a small business environment, and by small, I mean something like under twenty users. What’s important is how the numbers do or do not compare against each other across the various test types. This section lists the hardware, software, and configurations used in the tests. In the server used as the storage server, two Seagate ST3000DM001 drives were added to the defined configuration. These were placed into a mirror Storage Spaces array. Although it should not have impacted the test outcomes, both of the Hyper-V systems were expanded so that their internal drives are in a hardware RAID-1 configuration. No test was run from these drives. The hardware switch used is the Netgear GS716T device indicated in the document, with firmware version 5.4.1.10. This test used a virtual machine running Windows Server 2012 R2 Standard Edition in evaluation mode, build 6300. The virtual machine used in testing was running Windows Server 2012 R2 Standard Edition, evaluation build 9600. The testing software used was IOMeter version 1.1.0 RC1. The storage host is running Windows Storage Server 2012 R2 Standard Edition, same build and patch level as the guest. The two Hyper-V hosts are running Hyper-V Server 2012 R2, same build and patch level as the guest. No out-of-band hotfixes were applied to any system; only those available through Windows Updates were applied. The test virtual machine was a generation 1 machine assigned 2 virtual CPUs and 2GB of RAM. Its C: drive was a dynamically expanding drive with a limit of 60 GB. This drive was placed on separate storage from the test volume. The test volume was attached to the virtual SCSI chain and set to 260 GB in size. It was dynamic in some tests but converted to fixed for others. The type used will be reported in each test result. Both disks were in the VHDX format. Only one worker was allowed. The Maximum Disk Size was set to 65,536,000 on a disk with 4k sector size and 524,288,000 on disks with a 512b sector size; this results in a 250GB test file. Some tests, indicated in the text, broke the teams so that each node had 2x Realtek in a Dynamic load-balancing configuration passing all traffic besides management and storage. 2x Realteks were assigned their own IPs and participated directly in the storage network. The two Hyper-V nodes communicated with the storage server using 2 vNICs dedicated to storage communications on a specific VLAN. MPIO was enabled across the nodes’ storage NICs for iSCSI access. SMB multichannel was in effect for SMB tests. This was true in both vNIC and pNIC configurations. The MPIO method was the default of round-robin. Between tests, data was moved as necessary to keep the test file/VHDX as close to the start of the physical drive as possible. No other data was on the disk beyond the MFT and other required Windows data. Hardware RAID-1 would have been preferred for the 3 TB Seagate drives, but the onboard RAID array cannot work with disks that large. It is possible that the extra CPU load negatively impacted the local test in a way that would not have impacted any of the remote tests. There was no way to control for that with the available hardware. A truly scientific test would include more hardware variance than this. The switch presents the major concern, because another switch was not available to rule out any issues that this one might have. The following charts show a graphical representation of the results of each test. The next three show the individual result sets. Raw hardware access is always the fastest possible configuration. However, higher-end hardware would not experience the wide range of differences and would bring offloading technologies and optimizations that would close the gap. Local access is, as expected, faster than over-the-network access. 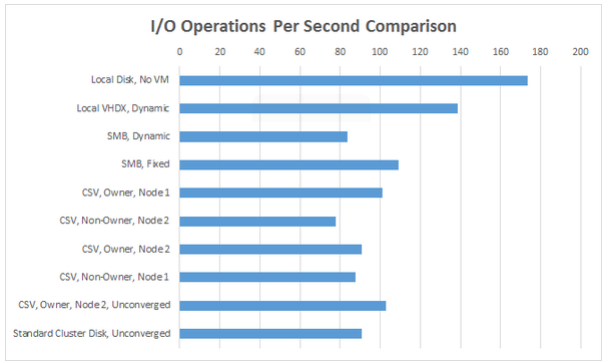 One thing the results are pretty unambiguous about is that dedicated physical NICs work better for storage communications than virtual NICs on a converged fabric. Again, higher-end hardware would reduce this impact dramatically. It also appears that running on a non-owner node has an effect. Unfortunately, with a test group this small, there’s no way to be certain that there wasn’t a network issue. This warrants further study. 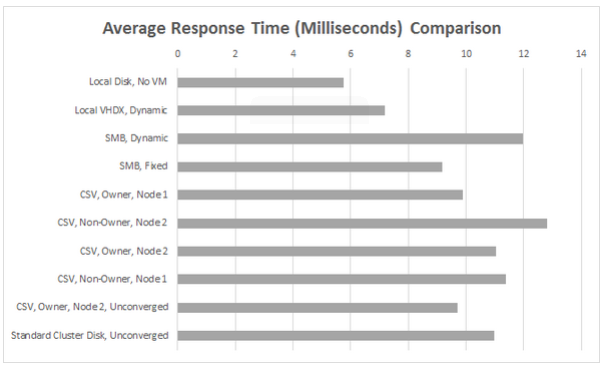 The multichannel SMB configuration showed that it performs better than an iSCSI configuration, all else being equal. This would also eliminate the penalty imposed by running on a non-CSV owner node. The difference between the dynamic and fixed SMB results was surprisingly wide. This disparity warrants further study.